I first came across Crystal Clear when they were showcasing a nifty little wand called 'Lift away the years' at a Debenhams beauty event earlier in the year. The vibrating wand helps to firm and tone the skin making it look instantly lifted and I was super impressed with the demo on the night. I was happy to then discover that they are also well known for their oxygen facials and microdermabrasion and on top of that have a wealth of skincare products available which include some real award winners. 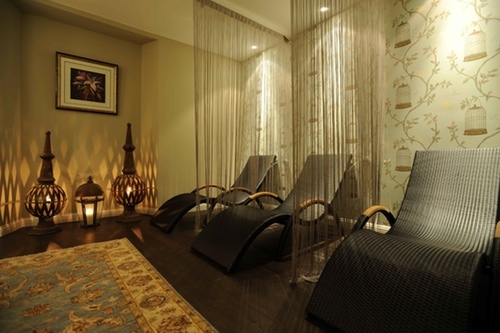 Their most recent facials focus more on this effective range of skin care instead of machines and I was delighted to be able to try one out at one of my favourite spa hot spots- the Chamomile Sanctuary Spa in Edinburgh. · Stay Young Intense Anti-ageing Facial - For ageing, tired, line & dehydrated skin. A perfect choice to improve sun-damaged, dehydrated and ageing skin types. · Problem Solving Facial - For oily, combination, congested, open pores & acne prone skin. The active ingredients used help to reduce the inflammation and diminish bacteria to improve the acne condition. · Problem Solvers Brightening Facial - For uneven, dull & tired looking skin. Results are obvious after the first treatment, the skin is firmer, smoother and more rejuvenated. As always in Chamomile the staff were so efficient and welcoming, I was settled into their luxurious relaxation room with a cup of tea pigs finest peppermint and ready to go. My therapist was a delight and talked me through the facial and how we could tailor it to what I required. As my skin isn’t quite suffering from ageing yet it is still however suffering from being dehydrated while also being dull so we opted to with the mask from the anti ageing facial and then finish with the brightening products. I really appreciate any salon or therapist who can offer that level of attention and care for your skin and making sure you achieve the results you set out for. The facial itself was wonderful, and while the mask set I was given a simply gorgeous shoulder and arm massage while it worked its magic. Once peeled off, my skin was topped off with the finishing products and I was thrilled with the instant results. Usually I would be rushing to slap on a little makeup here and there but my skin looked so plump and healthy I was more than happy to just to slick on some mascara to last me the whole of a day of adventuring in Edinburgh- unheard of from me! My skin looked incredibly bright and nourished thanks to the Illuminate radiance moisturiser that was used to finish, packed full of peptides, vitamins and essential oils and including the SPF I needed to protect my skin through the day- I was smitten with how it felt on. Another little beauty to go on my ever growing skincare wish list! This treatment was a really relaxing and soothing experience that would make a lovely gift for someone or just a treat for yourself to help get your skin party ready for the Christmas season.